Don't miss Alison Krauss - and that voice! 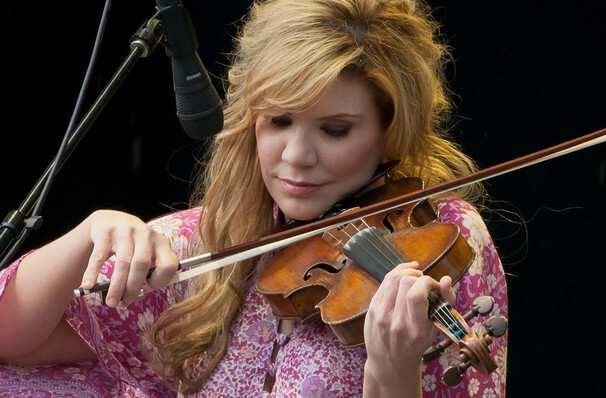 Alison Krauss Hits The Road! The sensational bluegrass-country singer and musician, Alison Krauss, is embarking on an extensive spring-summer tour. Tulsa, Oklahoma will be kicking this 50-date trek off, and more than a dozen shows will see Willie Nelson and family sharing the stage with Krauss as they co-headline. This huge tour sees Krauss supporting her fourth solo LP, which was released 2017, 'Windy City'. It's her first solo effort to top the Billboard Country Album Chart, where it debuted in that peak position and went on to score a Grammy nomination. In over two decades, Krauss has released 14 albums and sold more than 12 million records; this huge achievement went on to earn her 27 Grammy awards and a collection of various other awards. Sound good to you? Share this page on social media and let your friends know about Alison Krauss at The Anthem. Please note: The term The Anthem and/or Alison Krauss as well as all associated graphics, logos, and/or other trademarks, tradenames or copyrights are the property of the The Anthem and/or Alison Krauss and are used herein for factual descriptive purposes only. We are in no way associated with or authorized by the The Anthem and/or Alison Krauss and neither that entity nor any of its affiliates have licensed or endorsed us to sell tickets, goods and or services in conjunction with their events.